The NIH has announced that effective January 7, 2018 the salary cap has been increased to $189,600. This calendar lists the days when OSP is closed, NIH standard deadlines; and the date by which OSP needs to receive the completed proposal, [5 business days in advance of the deadline]. Please contact anyone on the OPS preaward team with questions! As of January 25, 2018, the NIH is requiring that proposals be submitted on the new E-forms. Any proposals submitted on old forms will not be accepted. Cayuse SF424 has been updated to conform with the new format but we thought that it might be useful to point out the most critically important changes. First, please note that all “parent” packages now have two versions – Clinical Trial and No Clinical Trial required. PIs will need to make a determination if the study qualifies as “clinical trial” vs. “clinical study.” [see our previous blog on how to make that determination]. If you go to page 222 of the Basic SF424 Guidelines, you will see all the requirements for determining what package to use and what documents are required. Secondly, PLEASE MAKE SURE YOU DO NOT ACCEPT OR USE A SUBAWARD FILE FROM FORM D as doing so will create an error which will prevent your proposal from being accepted. 1. Open the attachment titled “Electronic submission details” to see where you need to go. 2. Open the SF424 package that you will need to submit your application. 3. 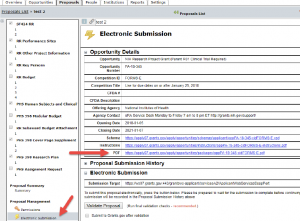 On the left hand side of the package, click on “Electronic Submission” with the lightning bolt. 4. Then, click on the PDF line. This will open the SF424 in the old Adobe package. Check the box for Subaward budget and then you can then download the subaward budget file that you need. Make sure your subawardees use this package only. You can tell if it is from Form E by the end date on the first page of the budget. It should be dated 2019 or later. *Thirdly, please note the attached file named “Format Attachments.” These are important guidelines about how the pages of the application should be formatted. If you have any questions about these items, please let the us know. The majority of changes in the PHS Forms -E relate to the consolidation of human subjects and inclusion enrollment information in the application. Previously this information was in several different places within the application. The new form also expands clinical trial data collection to allow reviewers the ability to improve oversight. A key focus of the new form set is the revised definition of Clinical Trial and Clinical Research. Please contact the OSP Preaward Team if you have any questions! The OSP Blog provides members of the UTHSC research community with up-to-the minute information regarding institutional and sponsor policy and procedural changes related to sponsored programs administration.